This is a workshop for the younger folks. Let’s inspire them to weave a unique piece of art that will be theirs to take home. Bring your child/grandchild or special friend to the shop and help them create their own colorful footstool. This class is age appropriate for 5-12. You do not need to stay if your child is comfortable. Each student will have the opportunity to work with dyed and natural reeds and learn the very basics of seat weaving. 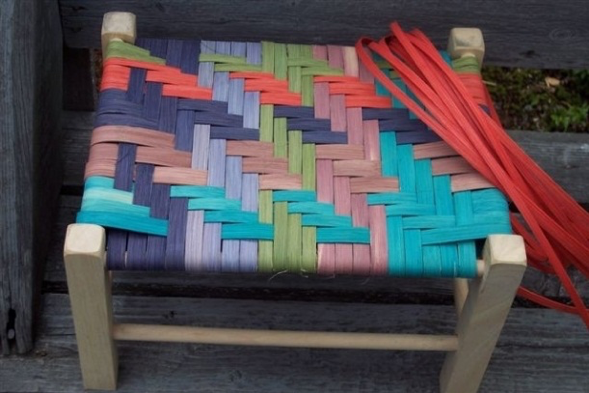 No previous weaving experience is needed. The workshop fee of $40. Checks should be made payable to Jean Reed and mailed to Murray Hill Weaving, 685 Murray Hill Road, Hill, NH 03243. Feel free to call 603-744-9737 or contact Jean with any questions.